The nobility of natural wood for true connoisseurs of real and durable products offers such an interior item as a double wooden bed, which is an eternal classic, never going out of fashion. The elegance of lines, a variety of patterns and forms demonstrate products related to this type of bed. In our online store are beds made of natural wood in Kharkov, made from these wood species with varying width of the bed from 80 cm to 2 m in all the variety of colors. In one product card there are several types of one design. Here you can select the color range and the desired width. 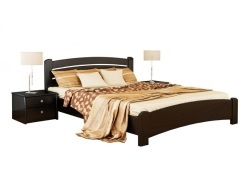 Therefore, you will definitely find the best option for arranging the interior of your bedroom. Despite the many compromises that modern furniture industry offers, making imitations of the texture of natural wood, natural material always remains in price. Regardless of whether you need a single wooden bed or its double version, you get an original piece of solid natural wood. She is able, like no artificially created material, to revive the interior of the bedroom, to give pleasure and a cozy atmosphere of comfort. It is no secret that a wooden double bed will serve for decades. The texture is treated with varnishes that convey the natural shades of the material. It can also be covered with paints that are consonant with the chosen room design. 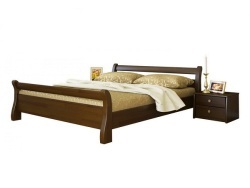 Of all the wood species used in the production of beds, Alder occupies the leading place. It is respected by both craftsmen for compliance with material processing, and buyers, because it has a beautiful structure, has both lightness and durability. Also, a single wooden bed made of beech is not less popular in the furniture market of our country. The characteristics of this wood are identical to oak, but at the same time beech products are more affordable and not so massive and heavy. In addition to the manufacture of furniture, beech is used as a building finishing material. Thus, you can harmoniously enter the bed with a naturalistic design of the bedroom and the whole house.